Like Schold’s post mounted equipment, all of our dispersing equipment can me manufactured as tank mounted models. 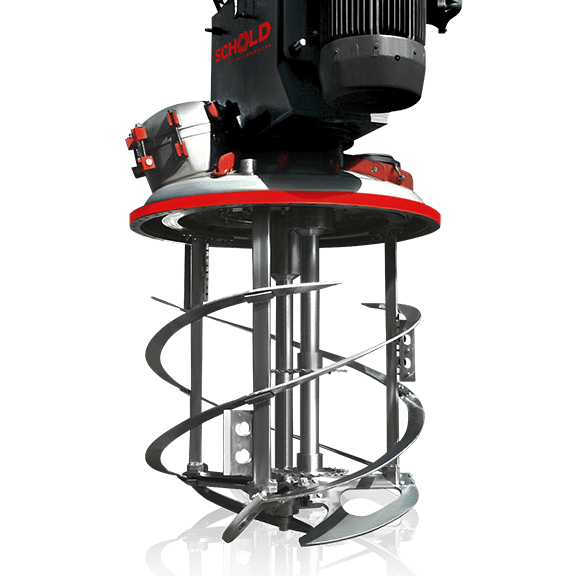 Instead of having a separate leg or post to secure the dispersing head, all of the components are mounted directly on top of the process tank/vessel. Tank mounted equipment can save space in tight factories and offer simpler maintenance with fewer mechanical parts. Schold offers two styles of tank mounted equipment. Flange Mount | Flange mounted tank dispersers are ideal for applications where pressure or vacuum is required to process a batch. The flange mount allows the equipment to sit on a stub with a heavy duty flange that can be mounted with an appropriate o-ring to maintain an air-tight seal. Bridge Mount | Bridge mounted tank dispersers are common in many industries and applications. They are ideal for placing over tanks where the application does not require any vacuum or pressure to be used during dispersing/mixing. Learn more about the Schold Tank-Mounted models through our digital Specifications Sheet.